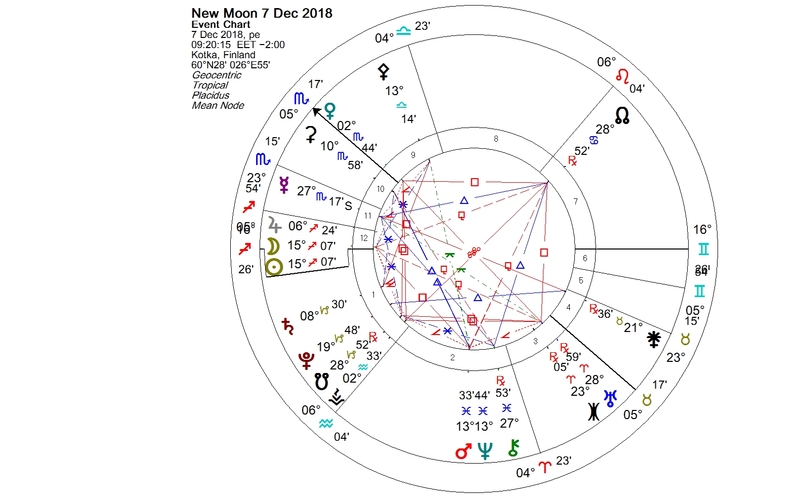 Mercury stationed direct on Dec. 6, and the next morning the New Moon at 15+ degrees of Sagittarius squared Mars-Neptune conjunction in Pisces. The New Moon fell on the Sagittarius Sun of Finland, which celebrated its independence and 101st birthday on Dec. 6. Finland’s Sun is at 13+ degrees of Sagittarius, so it was tightly squared by the transiting Mars-Neptune conjunction. The conjunction of Mars and Neptune, two planets with quite a different nature, can manifest in various ways. The action of Mars can be weakened by Neptune, and it can lead to passive-aggressive behavior, among other things. The transit could also mean spiritual activity, drug problems, or infectious diseases, just to mention a few. Transits don’t always manifest dramatically, however they can actualize in distinct and surprising ways. I was celebrating the Independence Day in a typical Finnish way by lighting two candles in the evening, having a glass of bubbly, and watching the presidential reception and ball on television. I was not sleepy after the broadcast, so at midnight I was still at the computer, just amusing myself by reading news reports and Independence Day greetings. Mercury turning direct tends to bring hidden information out. For me it gave a nearly 70 year old photo, which the local brewery had just published on their Christmas advent calendar. It was a photo of workers of the old local steam brewery, and to my amazement I was looking at the young face of my dad among the group. I know that he had worked there while in his youth, but I had never seen this photo before, and I hadn’t known that such a photo had ever been taken. My dad had a Sagittarius Moon and his Sun was at 15+ degrees of Scorpio. In traditional astrology the Moon rules beer, brewers and breweries. Neptune, one of the modern planets, is a co-ruler, and associated with alcohol and gases in general. Fiery Mars aided the brewing at this New Moon. This entry was posted on Sunday, December 9th, 2018 at 3:43 am	and is filed under Mercury station, New Moon. You can follow any responses to this entry through the RSS 2.0 feed. You can leave a response, or trackback from your own site.